A private equity fund acquired a manufacturer of aftermarket automotive condensers and coils in 2009. Within a year of the acquisition, the company lost its largest customer which accounted for 25% of sales, negatively impacting profitability and EBITDA. The equity group supported the business during the downturn with additional capital, but the incumbent lender decided to not renew the credit. Despite the fact that the private equity fund was familiar with the senior debt market and had multiple relationships, it recognized the value of having an outsourced debt placement agent and engaged Concord to run the process. Concord performed a situational analysis and prepared a detailed memorandum highlighting the successful ongoing turnaround, strong collateral base and committed ownership. 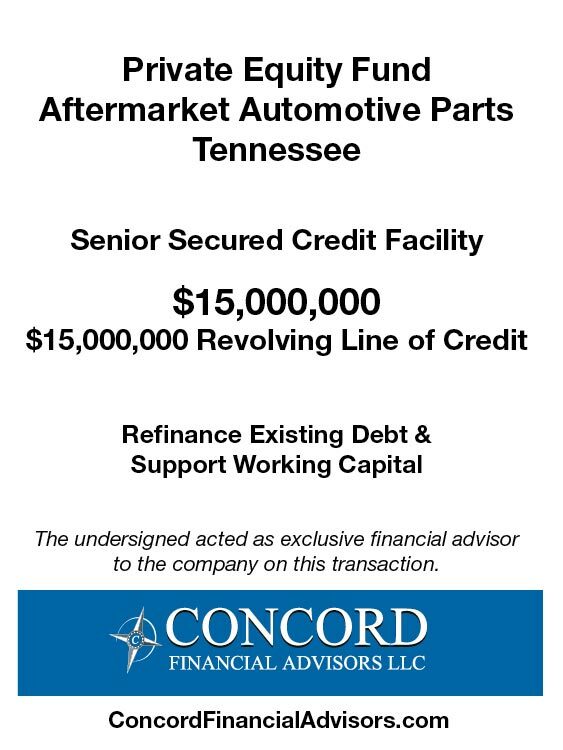 Concord was able to leverage its relationship with a nationally recognized asset-based lender and secure an aggressive structure for the company, including an over advance and quarterly covenants.